Should I get the rib patty? Or the beef patty? Or the fried shrimp patty? What about the cheeseburger? Screw it, you can get them all. At once. Behold the "With Everything Burger" ("zenbu nose baagaa" or 全部のせバーガー). Priced at 1,130 yen (US$11), it comes with lettuce, cabbage, egg, a slice of cheese, a cheeseburger, a rib patty, a fried shrimp patty, and a beef patty. Oh, it also has pickles and various sauces, like ketchup, mayo, and teriyaki sauce. 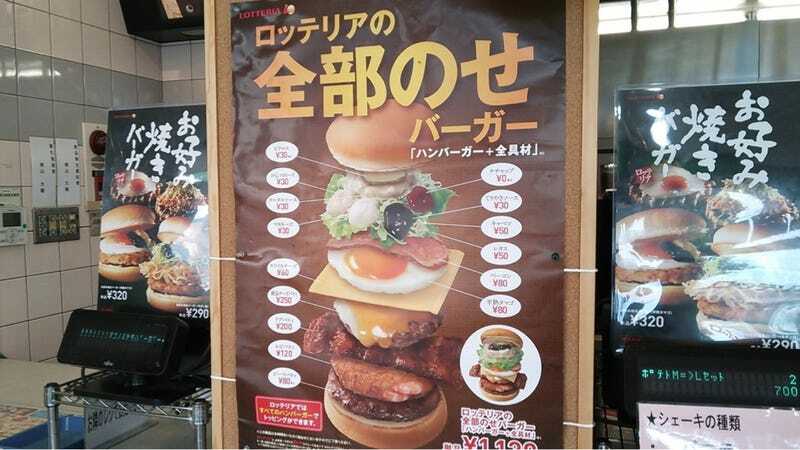 This is the latest offering from Lotteria, the Japanese fast food chain that not only serves up big burgers, but also nightmares and heart attacks.